The Company (defined below) is committed to maintain a work environment for its Employees (defined below) that is free from all forms of Sexual Harassment (defined below). The Company recognizes that Sexual Harassment at Workplace (defined below) is against the interests of its Employees and will not be tolerated. "Aggrieved Employee" means an Employee who files a formal written complaint of Sexual Harassment to the Internal Complaints Committee in accordance with the procedures set out under this Policy. "Alleged Offending Employee" means an Employee against whom a complaint of Sexual Harassment has been received by the Committee, until such time till he/she has either been released or held guilty of the charges levied against him/her by the Aggrieved Employee. "Committee" means the Internal Complaints Committee mentioned in point 6 above. • MSM Worldwide Factual Media Pvt. Ltd. & its branch office(s). "Disciplinary Action" shall mean all actions and punishments initiated under this Policy against an Offending Employee and/or an Employee who has made a false or malicious complaint of Sexual Harassment against another Employee and shall include, but not be limited to, (i) enquiry by the Committee, and/or (ii) imposition of Punishments on the alleged Offending Employee and/or (iii) imposition of Punishment on the Aggrieved Employee in case of a false or malicious complaint. "Employee/s" means any person employed directly or indirectly, by the Company including persons employed on a regular, temporary, part time, daily wage or ad hoc basis, whether employed for remuneration or not, or working on a voluntary basis or otherwise, whether the terms of employment are express or implied and includes a co-worker, a contract worker, probationer, trainee, apprentice or called by any other such name. This includes those employed without the knowledge of the Company; those employed either directly or through an agent including a contractor and also those Employees who are engaged on a casual or project basis. An Employee also includes probationers, trainees or apprentices. "Offending Employee" means an Employee who has been held guilty of the charges levied against him/her by the Aggrieved Employee. "Policy" means this Anti-Sexual Harassment Policy. "Punishment" shall mean (i) punishment imposed by the Company on an Offending Employee who has been found guilty by the Committee and/or (ii) punishment imposed by the Company on an alleged Aggrieved Employee who has made false or malicious complaint of Sexual Harassment against another Employee, and may include, but not limited to: warning, oral reprimand, written reprimand, withholding salary(ies)/wages and incentives, withholding promotion, transfer to any other location or office, suspension from work for such period as may be decided by the Company and/or termination of service, as the case may be. This Policy ("Policy") has been formulated in accordance with the laws applicable in India, including but not limited to The Sexual Harassment of Women at Workplace (Prevention, Prohibition and Redressal) Act, 2013 ("the Act") and lays down the procedure/s for making and responding to any complaints of Sexual Harassment. This Policy shall extend to all Employees of the Company and is incorporated by reference in the Code of Conduct and service conditions of all Employees. Any non-adherence to this Policy and/or its misuse will be strictly viewed and dealt with as misconduct under the terms of employment, leading to Disciplinary Action including termination of employment. This Policy aims to protect any Employee who in good faith believes he/she has been subjected to an act of Sexual Harassment by another Employee at the Workplace. • Any of the above acts coupled with the implied or explicit promise of preferential treatment, or threat of detrimental treatment, or threat about present/future employment status for sexual favours. No Employee shall be subjected to Sexual Harassment in the discharge of his or her official duties by another Employee at the workplace. Sexual Harassment, whether overt or subtle or quid pro quo creates a hostile work environment and is strictly prohibited by Company Policy. Individuals engaged in behaviour that qualifies as Sexual Harassment as per point 5 above will be held personally liable for such conduct and the Company shall reserve the right to take appropriate Disciplinary Action as set out in this Policy. For the purposes of this Policy, it is clarified that 'Workplace' will include the office premises, as well as any place visited by the Employee arising out of or during the course of employment, including and not limited to transportation provided by the Company for undertaking any journey, off sites and conferences. The Company has constituted an Internal Complaints Committee ("Committee") which is entrusted to consider, inquire into and suggest to the Company suitable Disciplinary Action against an Offending Employee who is proved to be guilty of Sexual Harassment. The Committee shall address any Sexual Harassment complaint(s) across the Company, including any complaint(s) received from any branch/administrative offices of the Company. The Committee will take all reasonable steps to initiate immediate and appropriate action against complaints of Sexual Harassment brought to its notice. The Committee will inquire into the complaint(s) and give reasonable opportunity of being heard to all the concerned parties. 6. Who can make complaints under this Policy? This Policy covers any Employee of the Company who is subjected to any act of Sexual Harassment by another Employee of the Company at the Workplace. writing to any of the members of the Committee, as soon as practicable, but not later than three (3) months from the date of occurrence of the incident amounting to Sexual Harassment (in case of a series of incidents, within a period of three (3) months from the date of the last incident). (ii) An Aggrieved Employee can request the Committee to try and resolve the matter between the Employees through a process of conciliation. If a settlement has been reached pursuant to such conciliation, the Committee shall record such settlement and no further inquiry shall be conducted by the Committee. 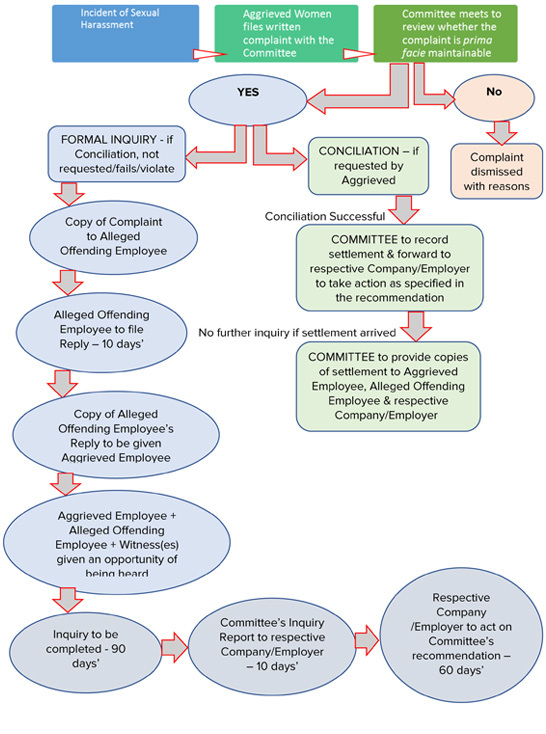 However, if the Aggrieved Employee informs the Committee that any of the terms or conditions of the settlement arrived at through conciliation has not been complied with by the Alleged Offending Employee, the Committee shall then proceed to make an inquiry into the complaint of the Aggrieved Employee. (iii) If conciliation fails to resolve the issue, or if the Aggrieved Employee does not want to resolve the issue through conciliation, the Committee shall proceed to conduct an inquiry into the complaint in accordance with the procedure laid down in this Policy. (iv) The Committee shall provide a copy of the complaint to the Alleged Offending Employee and the Alleged Offending Employee shall submit his/her reply in writing to the Committee within ten (10) working days of receipt of the complaint. (v) In case the Committee arrives at the conclusion that the allegation against the Alleged Offending Employee has been ascertained, it shall recommend to the Company the appropriate Disciplinary Action to be taken against the Offending Employee. • Restrain the Alleged Offending Employee from reporting on the work performance of the Aggrieved Employee (if applicable) and re-assign this responsibility to a senior authority. (ii) The Alleged Offending Employee and the Aggrieved Employee may be represented or assisted by a friend or near relative; however, no representation through lawyers or Non-Government Organizations will be permitted by the Company. (i) This Policy shall not be used to bring false or malicious complaints against anyone. (ii) If the Committee decides that a Sexual Harassment complaint filed by an Employee is malicious and/or false and/or on forged/misleading document(s), it may recommend to the Company to take appropriate Disciplinary Action against such Employee(s). A mere inability to substantiate a complaint or provide adequate proof shall not attract action against the Aggrieved Employee under this clause. The malicious intent on part of the complainant needs to be established in an inquiry, before any action is recommended. (i) All complaints lodged under this Policy shall be strictly confidential. (ii) The name and identity of the Aggrieved Employee and/or the Alleged Offending Employee, and witnesses, information relating to conciliation and inquiry proceedings, recommendations of the Committee and actions taken by the Company shall not be published, communicated or otherwise made known to the public/press/media in any manner. However, information may be disseminated regarding the justice secured to any victim of Sexual Harassment under this Policy without disclosing the name, address, identity or any other particulars calculated to lead to the identification of the Aggrieved Employee(s), Alleged Offending Employee(s) and witnesses. (iii) The Internal Complaints Committee will advise or consult only with those who have a need to know about the allegations, including witnesses who may have knowledge of the circumstances surrounding the allegations and who may be interviewed as a part of the inquiry. (iv) If any person entrusted with the duty to handle or deal with the complaint, inquiry or any recommendations or actions under law, or any person who has been interviewed as a part of the inquiry, contravenes his/her confidentiality obligation, or retaliates against the Aggrieved Employee, he/she shall be liable for penalty in accordance with the provisions of the service rules/Company Policies, as applicable. (i) It is important for Employees to recognize the issue of Sexual Harassment and take appropriate actions to avoid and/or report the same. • Does the behaviour make me uncomfortable? • Does the behaviour violate my dignity as an individual? • Does the behaviour violate my right to work in a safe working environment? (a) Being aware of situations: In uncomfortable situations, the Employee should use appropriate judgment and not hesitate to remove himself/herself from the setting immediately without fear of repercussions. The Employee has the right to refuse to accompany the perpetrator or respond to personal questions if it makes him/her uncomfortable, but this right should not be exercised to avoid any disciplinary proceedings. (b) Voicing objections: Speaking out against Sexual Harassment is an effective tool in combating it, as it highlights the existence of this problem which in turn enables the Company to take effective measures against it. Objecting firmly and clearly to such behavior when it occurs lets the perpetrator(s) know that it is offensive. Sometimes writing a firm letter/email detailing the uncomfortable situation to the Alleged Offending Employee can be more effective than a verbal request. If the Alleged Offending Employee persists in his/her objectionable behavior, a complaint must be made in writing to the Internal Complaints Committee. (c) Gathering evidence: If an Employee is convinced that he/she has been/is being subjected to Sexual Harassment by another Employee, then keeping a detailed written account of events (including but not limited to dates, times, places, frequency and an account of what has happened), preserving any letters, notes, or other documents received would assist the Internal Complaints Committee in its deliberations. This Policy is subject to the provisions of the Act and the Rules framed thereunder and will be reviewed periodically by the Company and shall be subject to change.